FEATURED IN THE BIG OPEN HOUSE. 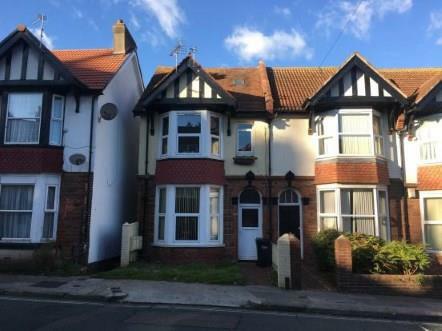 A one bedroom flat, with easy level access to the town and the sea front. Comprising of communal entrance, main hallway, which opens into open plan lounge with kitchen down one side of the room. Large bay windows to the front. One bedroom and a bathroom to the upper floor. The property is being offered for sale with a tenant in situ making an great Buy To Let. Double glazed front door into communal hallway, further wooden door to stairs. First floor landing own private front door. Stairs raising to first floor where the bedroom and bathroom is. Door through to open plan living. Double glazed bay window to the front, with further window to the front. The kitchen area has fitted wall and base units, with inset single sink and drainer, space for further appliances. Double glazed window to rear with views over the town. Electric wall mounted heater. Three piece suite with panelled bath, with electric shower over, tiled splash backs, low level WC. Wash hand basin. Velux window. Parking on first come basis at the front.